Can we utilize Microsoft® Azure and extend our service portfolio to provide operations? Before answering this question, let me introduce the problem. As a successful solution provider for Microsoft® SharePoint and SharePoint based applications, we neglected operations. Mainly, because we cannot – could not – provide the necessary hardware and Service-Level-Agreements (SLA), and secondly, because we were never asked to provide such measures. Furthermore, cloud-based solutions were not available especially because Microsoft® explicitly did not support cloud-based SharePoint farms. Until now. Azure provides Infrastructure as a Service (IaaS), the service provider deploys and maintains Active Directory (AD) and SharePoint VMs and customers use “SharePoint as a Service”. Customers have no administrative rights on the VMs and have defined access rights to SharePoint. Azure provides IaaS, we deploy and maintain AD and SharePoint VMs as stipulated by contract, customers maintain and use the system. Customers have defined administrative access rights to the SharePoint farm. Azure provides IaaS, we set up AD and SharePoint VMs as stipulated by contract, customers maintains and use the system – or delegate maintenance the service provider. Further services are provided as agreed. Customers have full administrative rights. 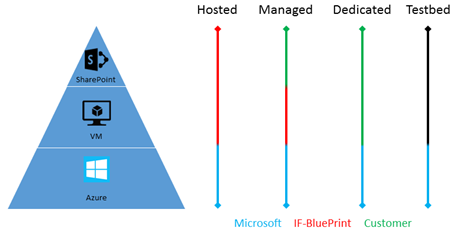 Figure 1 illustrates the mentioned service scenarios, showing the level of responsibility and influence of the participating parties, with Microsoft always being responsible for Azure itself. In the past, both cases required a higher need of greatly expensive resources (hardware, software, housings, infrastructure, energy, maintenance, etc.). Today, with cloud-based IaaS, business can concentrate on its main priorities by turning capital expenditure into scalable running expenses. This results in effective productivity and flexibility. Flexibility is more in focus on a managed SharePoint farm and offers the technical personnel larger freedom in supporting their company’s business workflows. Without any need of high investments, though. Does an enterprise want or need a steady hand on the tiller? Then a dedicated SharePoint solution is the goal: The IT department keeps full control, with the necessary support and configuration, provided by us. Even if a customer just needs a safe and isolated testbed for update evaluation, backup-and-restore-tests, or the like, Azure can serve as you well! What all of these solutions have in common is to seamlessly connect to an enterprise on premise network via secured VPN. Furthermore the cloud-based farm can be synchronized with the on premise Active Directory and SharePoint farm. Finally we conclude: Yes, Azure has the potential to extend our portfolio in a way that allows you to focus on your customer’s business, and thereby enabling us to provide you with the best chance in concentrating on your business! Finally, one thing is for sure: If you are in need of a competent SharePoint solution provider – feel free to contact us!